Henry George Farmer, a British musicologist, graduated PhD from the University of Glasgow in 1926. He was born in Birr, Ireland, son of an interpreter of the same name who served in the British Army. Farmer played in the Royal Artillery orchestra until 1911, and was regarded as an authority on military music and bands. He went on to work as a musical director in London during which time he became interested in oriental and Arabic music. 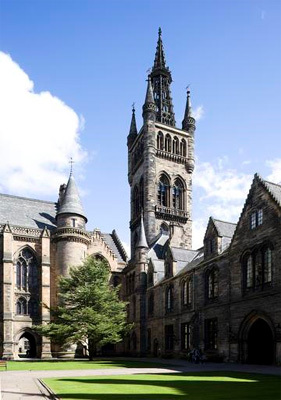 Farmer consequently enrolled at the University of Glasgow and was a student from 1918-1924, during which time he studied subjects as Arabic, Geology, History, Moral Philosophy, Education, and Italian. In 1919, he matriculated as a Research Student of Arts, researching The Art and Science of Music of the Arabs of the Middle Ages. Farmer graduated PhD with his thesis A musical history of the Arabs from the days of idolatry to the time of the Buwaihids in 1926. He wrote articles on Scottish and Arabic music, publishing his influential work A History of Arabian Music to the XIIIth Century in 1929. He was the only British representative to the Congress of Arabian Music in Egypt in 1932. Farmer was awarded a DLitt from Glasgow University in 1941 and an honorary doctorate from Edinburgh University in 1949. He was also appointed a governor or the Royal Scottish Academy of Music in 1950, a position he held until 1962. He was involved in the cataloguing of Scottish music at the University of Glasgow Library, and appointed Music Librarian in 1951, retiring in September 1965. A collection of Farmer’s personal papers and correspondence, along with his personal library are held by the University’s Special Collections Department. The manuscript collection includes diaries, drafts of books and articles, and correspondence with contemporary composers and music critics. Farmer’s personal library consists largely of modern books - including those which Farmer wrote himself - this collection includes volumes of Oriental works, music, and works on the Royal Artillery, as well as general literature.